The wind blew on Friday and snuffed the lamp out. The wind blew. The earth shook. Darkness settled down like a heavy, suffocating pall. Wailing and mourning and oppressive grief filled every fold. Go home. Light the fire. Think of other things. Did the sun rise on Saturday? Did the birds dare to sing? Maybe. Probably. But it was not a day like any other. Darkness still reigned in the hearts of God’s people. Their hopes and their dreams died a slow death on Friday. As they watched, their peace drained away in wandering rivulets down the beam of a Cross, finally – mercifully – soaking into the dusty earth. The lamp had been snuffed out on Friday. On Saturday, for them, the sun did not rise. 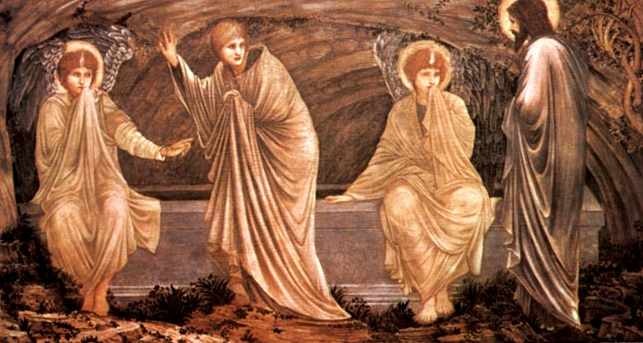 On Sunday morning, while it was still dark, they headed for the tomb. Heavy of heart, burdened with sadness, they brought spices to honor the One in whom they had trusted; the One they loved. On the way, the sharp darkness began to soften. Would the sun indeed rise this day? Does His everlasting light shine in you? 12 Responses to Did the Sun Rise? At our church yesterday, they started off the celebration service with the short video sermon “Sunday’s Comin'” made especially powerful through the delivery of the late preacher S M Lockridge. What a powerful way I thought that was to set up the darkness that seemed to reign… until Sunday brought new hope. EV-Friday was not the day Jesus died and Sunday was not the day Jesus was resurrected! You are so excited to point out any flaw, be it a person or words spoken, in the Mormon religion. Why not try and learn from each other and seek the restoration of all things! Jesus was in the tomb for 3 days and 3 nights. Let’s count them. Friday, day 1 (a day in the Jewish religion is sundown to sundown), Friday, night 1, Saturday, day 2 Saturday, night 2, Sunday day 3, Sunday, night 3 so he would have risen on Monday. Unless we do not believe Jesus and he was only going to be in the tomb for 3 days and 2 nights. Jesus said Matt. 12:40 For as Jonas was three days and three nights in the whale’s belly; so shall the Son of man be three days and three nights in the heart of the earth. Hmm. So are you going to comment or just ignore it? Woenigma, Jesus was not born on Dec 25th either. So what’s your point? These holidays celebrate the fact that he was born of a virgin to save us all, and in the case of Easter, that he rose from the dead to complete our salvation in his victory over death. If you’d like to get stuck on the details of this, fine, but know that we celebrate what the actions mean. Finally, you reference paradise as a place other than heaven. This is Mormon belief. We do not share it. When the Sabbath is not even the Sabbath how is that getting caught up in details? Jesus did not do away with the Passover or any of the other feasts (restoration of all things) so why have EV and Mormons abandon them? Jesus came to the city to celebrate Passover not get rid of it. He was killed on a Wed and rose on Saturday. They all came to look for him on Sunday after the Sabbath. But you are so caught up on bringing up every minute detail of ANYTHING wrong that you miss the simple truths in the Bible and you care nothing of expanding your knowledge base! Asleep at noonday. Woenigma, I’m not sure I understand your response. First of all, there is no evidence to suggest paradise is a place other than heaven. This, to me, is Mormons seeking answers to everything when such answers are not always a)necessary and b) decipherable. My chuch, mcleanbible.org, takes this stance, and I have seen it many other places: where the Bible is definitive, we must be definitive, but where the Bible is silent, we must be silent. As to your stating his death was on Wednesday and was raised on Saturday, have you looked at Sharon’s link? You should. It explains the apparent discrepency. But I still maintain that the point of the Easter Holiday is to celebrate that Christ rose from the dead, not that he rose on a Sunday. I’m not sure how your rebuttal plays into that. This is the 3rd time I have asked. Where was Jesus for 3 days and nights if he had still not gone to his father? The Bible is not silent. When Jesus was on the cross with the malefactors, he said, “To day shalt thou be with me in paradise.” Yet 3 days later he had still not ascended to his Father. How is your response of “not necessary and decipherable” any different then a Mormon baring his testimony when he does not want to confront the truth? I have brought up many things that get ignored IE Romans 5:11-21 (why the atonment is possible), Genesis chapter 1 and 2 about two creations done by two different people (God and Lord God). The fear of the Lord is the beginning of knowledge: but fools despise wisdom and instruction. Receive my instruction, and not silver; and knowledge rather than choice gold. Christmas and Easter are pagan holidays when you stand before Jesus how will you explain celebrating pagans and not the Passover? Joseph Smith has know since 1830 that Jesus was born on April 6, one more thing that is ignored. Here are some sites that address your question: where was he during that time? Some of these say Hades, which was a separate place the dead went until after Christ died and is no longer in existence. First, some more on the three days/nights issue: Either way (these say different things), it works. Second, here is the question on where Jesus was. This is interesting, because I have heard it was hell. But even from what I was told, there is scant evidence to suggest it with finallity. Again, we are using very few verses to make huge doctrinal statements from. This is where it gets dangerous. Again, I’ll say we are better served to focus on what he did rather than where he was. Whether heaven/hell/Hades is a secondary question. Most people assume that Jesus descended into hell because of the Apostles Creed, “He [Jesus] descended into hell and on the third day He rose again.” This does not mean hell, as in the lake of fire created for Satan and his angels, or to be tortured by Satan and his angels, such a view is heretical because He had finished bearing God’s wrath on the cross. (John 19:30) This is simply a poetic way of saying that He truly and assuredly died on the Cross. I am not sure what you are getting at with Romans 5 and Genesis 1-2 there is nothing on this thread about them. As for our celebrating Christs birth on December 25 and Easter sometimes apart from passover what of it? Do you celebrate the sabbath on a Saturday? Why Not? I know the answers to the questions, I was curious as to your answer. 1.I did read some of the web sites. When Jesus died and arose was the same answer I had Wed (died) Rose on Saturday. My point being, if the EV think they have it so right how can one of the cornerstones of your believes be celebrated on the wrong days (Good Friday and Easter) and why don’t you question it and set it right? Why are you content to stop learning? 2. What about 1 Peter 4:6 For for this cause was the gospel preached also to them that are dead, that they might be judged according to men in the flesh, but live according to God in the spirit. The site did not want to include this one for some reason. Jesus went and preached to the dead! I know this shakes what you believe but it shows that those that are not “Saved” (whatever “saved” means because everyone gets resurrected) still have a chance for exaltation or Jesus would not have wasted his time and preached to them. This is where baptism for the dead comes in, another part of Mormonism that I can’t give back because if gave me more understanding. Those that have not had the gospel still must have the work of the temporal body done. It takes the Living and the Dead working together, hearts of the fathers to the children and the heart fo the children to their fathers Mal 4:6. People that die now where do they go? What is the EV belief? Jesus does go some place for 3 days and nights, be it hell or paradise, but we know it is not heaven. You are just choosing to ignore the Bible “simply a poetic way”. We know people do not get resurrected when they die, but they go some place, there are to many people that have had similar near death experiences to ignor their accounts. I have posted Romans 5:11-21 several time and it just gets ignored, I think the Genesis post was deleted; so I figured this would be the same. As for Christmas you are celebrating a pagan God’s birthday and Easter is about celebrating fertilized eggs. When one of the 10 commandments is no other god’s before me and not make graven images, I think both these commandments are being broken with Christmas and Easter. Why not celebrate Passover instead of Easter and Jesus birthday on his birthday in April? As for your scripture you quoted it is a good one, but when you know the truth should you continue in the incorrect belief? I’m really disappointed in you, woenigma, for taking what was meant to be such a simple, beautiful post on the celebration of the resurrection of Christ, and turning it into an unedifying discussion. Perhaps this is just part of Mormonism, to take the main, beautiful truths and overshadow them with peripheral controversies. I’m closing this thread down.